The low maintenance 3M 6700 Full Facepiece Respirator is light and well-balanced. An innovative lens design offers a wide field of vision. Accepts all 6000 Series cartridges and 2000 Series filters found on our filters & cartridge pages. NIOSH (National Organization of Safety & Hazard) approved. Face piece only - Filters sold separately. First, allowing only filtered air to touch your eyes and enter your lungs can be a good thing. For instance, when working with mold, spores can enter through the eyes, causing irritation and disease. Second, the polycarbonate lens is rated as primary eye protection, meaning that you don't need safety glasses when wearing one. If you wear prescription eyewear, a 3M 6878 Spectacle Kit is offered to fit inside the mask. Wearing contact lenses is discouraged. 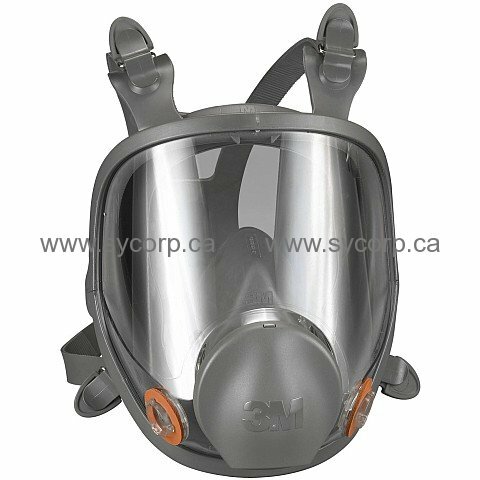 Third, is the higher protection factor offered by a full face respirator. In the case of a half mask respirator, the assembly is rated for 10X the PEL (Permissible Exposure Limit). That is, if the PEL for a particular dust or vapor is 5mg/m3, the half mask user may be exposed to 10X that amount. But with a full face respirator, because of the inherently better fit, you may use it up to 50X the PEL. The fit is better because the sealing surfaces against the skin are on the smooth parts of the face, rather than having to work around the nose. As with all masks, facial hair will compromise the seal, and the protection will be reduced or eliminated. Mask comes with a peel off clear lens cover to protect it from paint and debris. Additional lens covers can be ordered.